Cover crops are proving to be vital in the development of soil health. Growing cover crops is perhaps the most valuable strategy we can adopt to feed our soil, build up its fertility, and improve its structure with each passing season. Green manure is a cover crop used primarily as a soil amendment and a nutrient source for subsequent crops. In most production environments, lack of nitrogen limits plant growth more than any other nutrient. Legumes, however, possess a symbiotic relationship with rhizobial bacteria capable of transforming atmospheric N2 into plant usable form and may accumulate large amounts of N via this pathway. Legumes utilized as green manure therefore represent a potentially renewable source of on-farm, biologically fixed N. Unlike chemical N fertilizers, legumes may also fix and add large amounts of carbon to a cropping system. 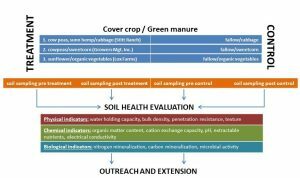 Green manure approaches may also drive long-term increases of soil organic matter and microbial biomass, further improving nutrient retention and N-uptake efficiency. When used in place of fallow, well-chosen green manures may reduce erosion and suppress weeds and specific crop pests. Green manures may also offer habitat or resources for beneficial organisms. All of these processes are quintessential for improving soil quality. We propose evaluating sunn hemp (Crotalaria juncea) and cowpeas (Vigna unguiculata) as two green manure options that would perform well in Florida during summer. The purpose of this project was to identify growers within Florida that practiced cover cropping during the fallow period. Due to the climatic variability within the state from North to South, in south Florida the fallow period is usually summer month, while in north Florida winter months are usually fallow. As part of this study we were able to identify 8 collaborative growers across the state, representing 9 unique farming programs. The common denominator being that they all cover crop during the fallow period. Once we had identified the growers, we wanted to shadow their practice and collect soil samples before and after their cover cropping program, to evaluate the change in soil health properties as a function of cover cropping. Locations of various collaborative growers that participated in this study. 2 Each year my program organizes a booth at two annual events (i) South Florida Fair, (ii) Fall Scarecrow Festival. These events attracts general public along with local growers, farmers and ranchers. The South Florida Fair is an annual winter event that lasts for 17 days and attracts nearly 15,000 people each day. We displayed information related to soil health and sustainability within the region, and the importance of cover cropping to improve soil quality. As part of our Education and Outreach program, we have had at least 20 consultations with our collaborative farmers. These consultations typically are held at their farms and last about an hour. The educational tool that was developed in the last year was a six-module In-service training (IST) comprising of presentations and hands-on demonstrations on the topic of soil health and sustainability. Two such training was provided to the agricultural professionals, particularly extension agents and extension specialists. The topics covered included subjects like soil health principles, soil microbiology, soil health indicators, benefits of cover cropping etc. This IST is now also available online for agricultural professionals to take remotely. In 2018, we compiled a Soil Health and Sustainability Handbook, that will be distributed to all our project collaborators. Our future planned activity includes conducting a training in 2019 for the growers on the topic of soil health and sustainability and also publish an extension article on the topic of cover cropping during fallow period. As part of the first year of this project we had six collaborative growers on whose farms we were able to get both pre and post cover cropping soil samples. We were also able to identify one new Extension agent, and two additional growers (3 sites) that wish to participate in this study during year two. Results indicate that 2/6 farms showed a reduction in bulk density (BD), 3/6 showed an increase in BD, whereas 1/6 farm showed no change in BD. Soil pH reduced in 4/6 farms, whereas 2/6 farms showed an increase in soil pH. 5/6 farms showed an increase in maximum water holding capacity (MWHC) of the soil, whereas only 1/6 farm showed a decrease in MWHC. 4/6 farms showed an increase in organic matter (OM), whereas 2/6 farms showed a decrease in OM content. All 6/6 farms showed a reduction in Active carbon content. Cation exchange capacity (CEC) appeared to increase in 3/6 farms, whereas remaining 3/6 farms showed a decrease in CEC. 3/6 farms showed a increase in total Kjeldahl nitrogen (TKN), whereas the remaining 3/6 farms showed a decrease in TKN content. Total phosphorus (TP) increased in 3/6 farms, whereas the remaining 3/6 farms showed a decrease in TP. 4/6 farms showed an increase in Mehlich-3 P (M3P) content, whereas 2/6 farms showed a decrease in M3P. All 6/6 farms showed a reduction in Mehlich-3 potassium (M3K) content. Soil protein increased in 5/6 farms, while 1/6 farm did not show an increase in soil protein. As part of year two of this study, we hope to have results from all six year one collaborative growers, in addition to three additional collaborators that emerged as part of this study (total 9). We would also like to share that based on the emerging results, seems as though MWHC increases, while soil potassium content decreases as a result of cover cropping. It may be important to add K for subsequent crops after cover cropping during the fallow period.